VPS Scope, Tuner from Vengeance Sound. If you own any of the Vengeance Sound plug-ins, the developer has a gift waiting for you under their Christmas tree. 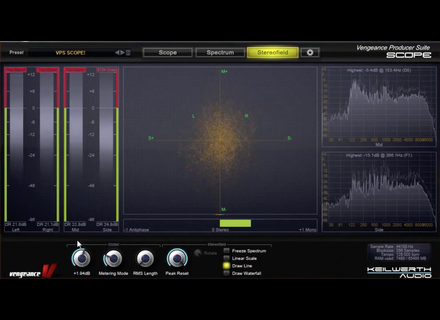 Vengeance Sound offers the VPS Scope, an audio analyser plug-in in VST2/3, AU and AAX formats for Mac and Windows. 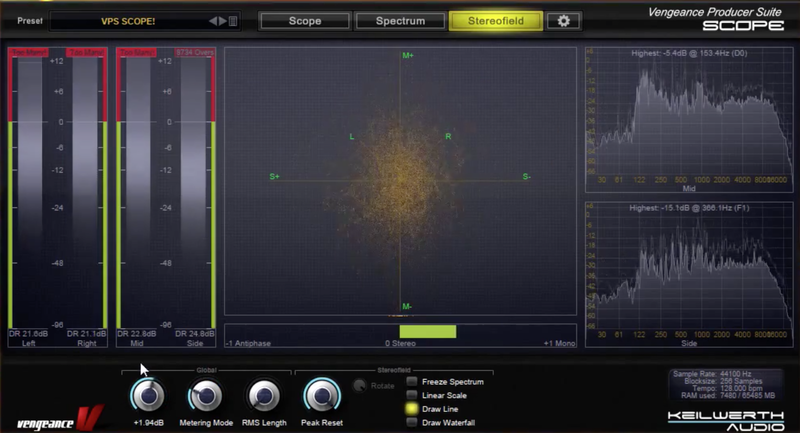 The plug-in features multiple VU-meters, an FFT analyzer, a stereo vector-scope and a 3D-type spectral analyzer. You can also display the correlation, choose a Mid/Side analysis mode, zoom on the waveform and choose between synced or free operations. If you have at least one Vengeance Sound plug-in licence installed on your Synchrosoft / eLicenser USB dongle, you can install the VPS Scope after downloading it from www.vengeance-sound.com. Flux:FX, a multi-effect audio app for iPad Adrian Belew partnered with ElephantCandy and Mobgen to create Noiise Audio and offer a brand new multi-effect app for the iPad. Overloud REmatrix Review Overloud, author of SpringAge and BReverb 1 and 2, extends its range of reverb plug-ins with REmatrix, which includes several convolution engines and an effects chain. Does it simply increase the possibilities of a tried-and-true technology or is it a new approach to the creation of spaces? Holiday sale at eaReckon eaReckon launched this morning their Holiday Sale with discounts on their EARebound and EAReverb plug-ins through January 4th.